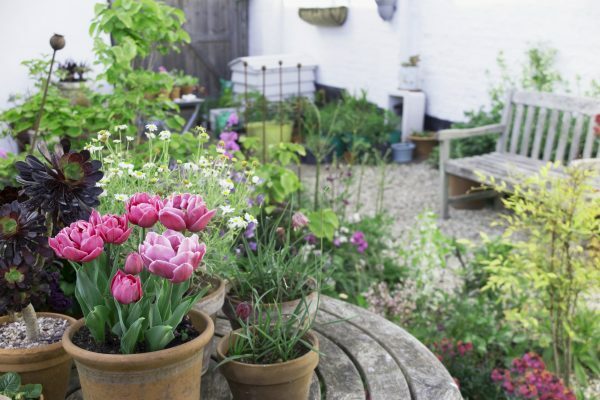 Whitstable Open Gardens is held every year in June for the NGS. 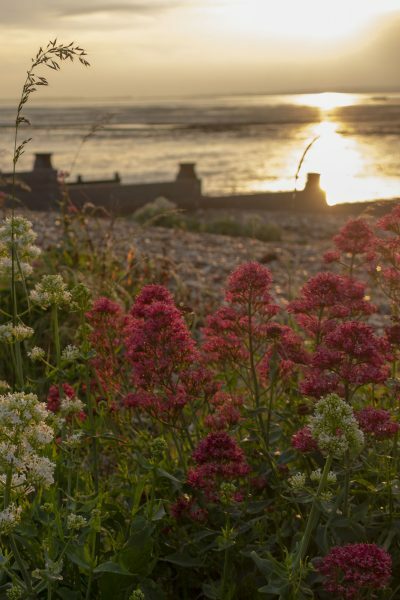 Wildflowers on Joy Lane beach at sunset. 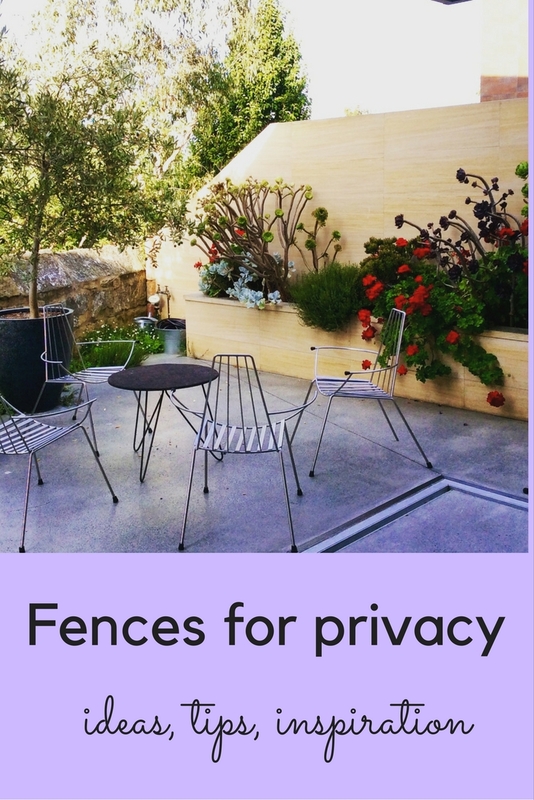 There are two gardens in Joy Lane in Whitstable Open Gardens. 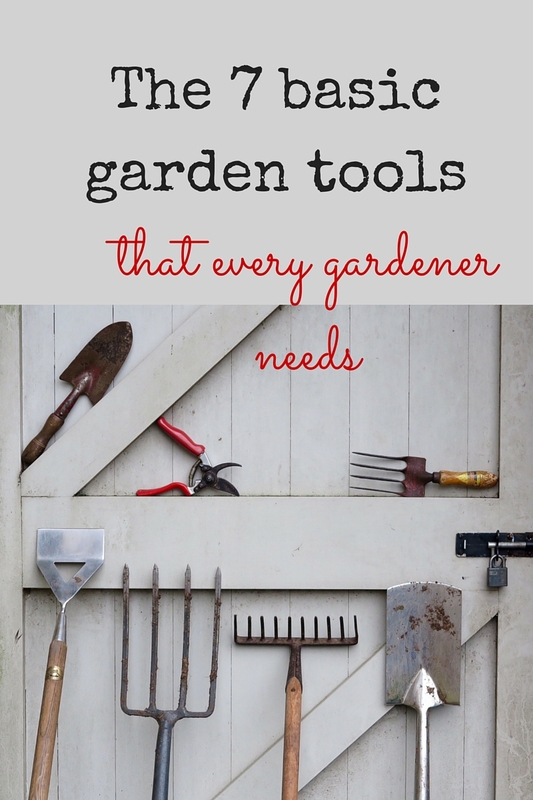 But even if you’re nowhere near Kent, let me treat you to a few of the summery seaside garden ideas. This really is a delightful group of small town, beach and roof gardens. Teresa Brown lives in an Arts & Crafts house – one of the earliest built in Joy Lane, Whitstable. 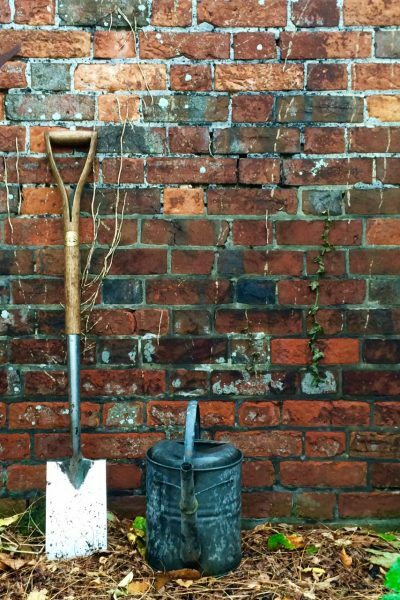 She has been wonderfully creative with her paths and terraces, using offcuts of brick and tile to create paving. 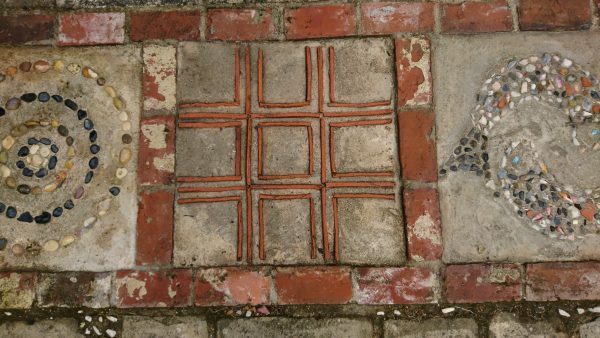 The pavers surrounding the pond include a checkers board in tiles, a sunburst plus a lizard design. Teresa did them using pebbles, tiles and other found objects. Photo by Francine Raymond. The Browns raised five children at the house, and now they have grandchildren. 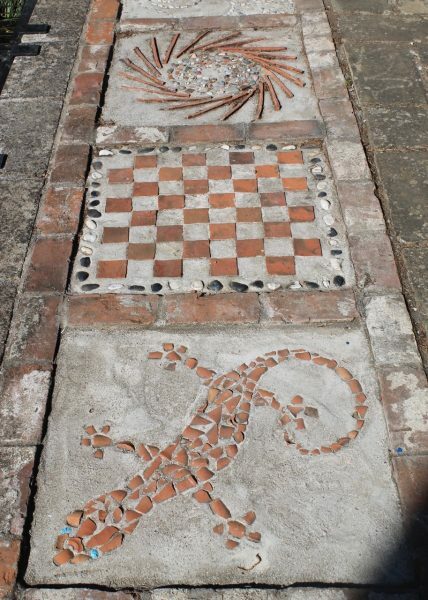 She’s made a tile and brick ‘noughts and crosses’ paver beside the pond, which they can play with shells. Noughts and crosses by the pond. To be played with shells. 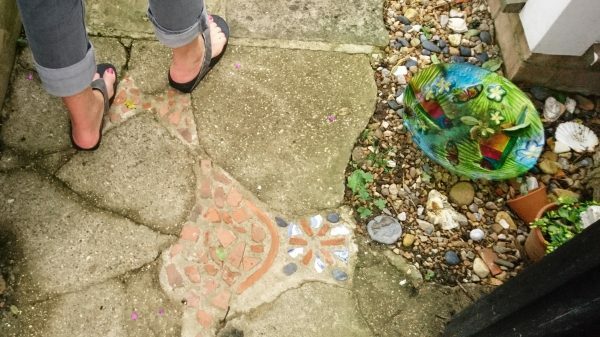 Teresa brightened up a cracked concrete pathway by opening the concrete up a bit more then filling it with patterns made with tiles and bricks. 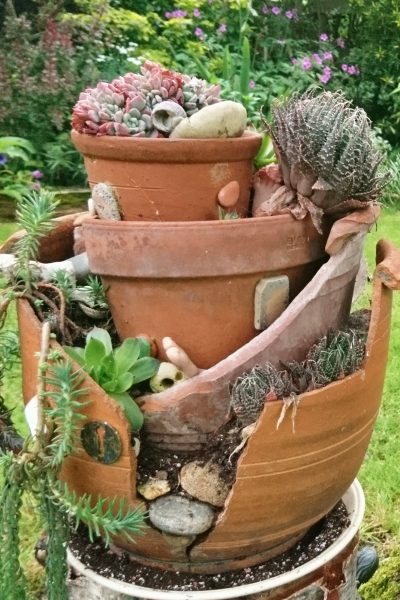 Teresa has put together a number of broken pots in an unusual arrangement. 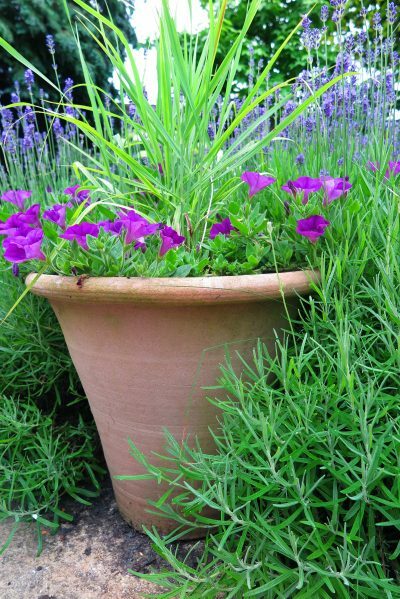 Teresa has used several layers of broken pot for this arrangement. Jelly moulds and succulents at Clare Road for Whitstable Open Gardens. 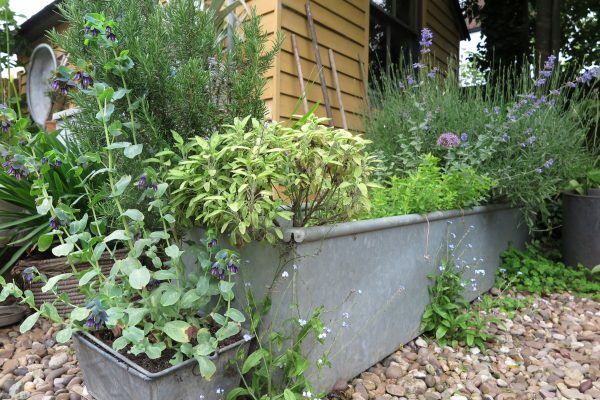 A galvanised agricultural feeding trough used as a garden planter further up Joy Lane, home of garden writer Francine Raymond. 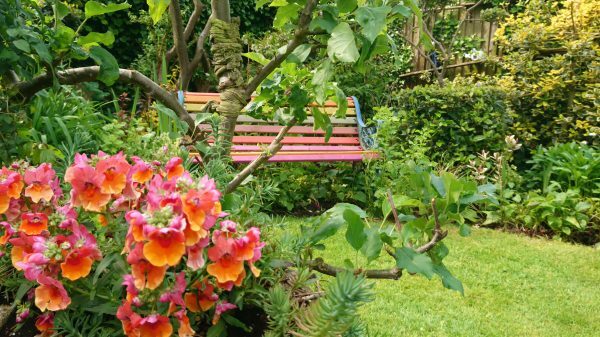 Teresa Brown painted an ordinary garden bench in stripes of colour, and then matched it with the planting. 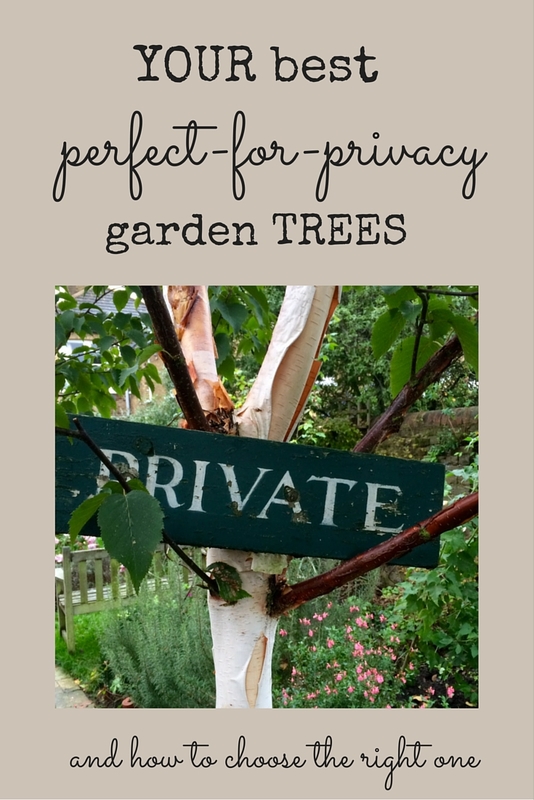 At Joy Lane for Whitstable Open Gardens. 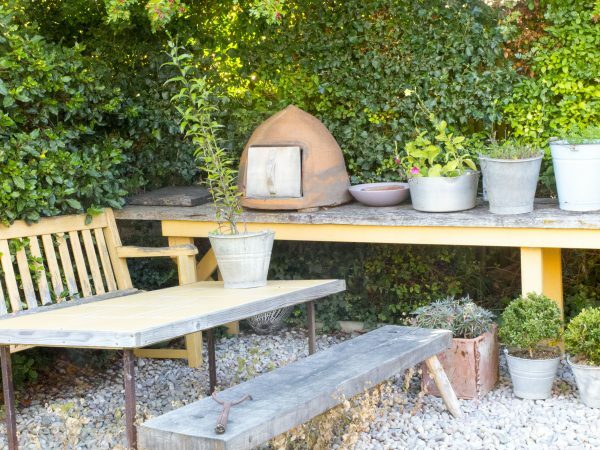 Francine has a two-colour theme in her garden – grey and yellow. That’s because she has a yellow brick house with grey slates. 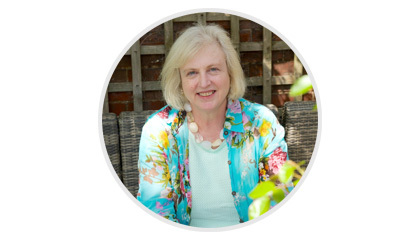 She buys garden furniture in junk shops or car boot fairs and ‘pulls it all together’ by painting it either yellow or grey. 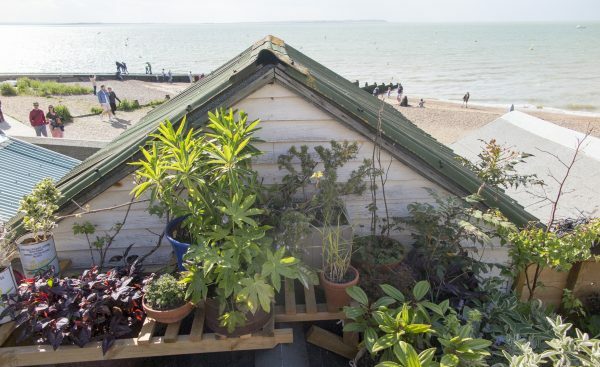 Ocean Cottage has a tiny roof garden with an idyllic view and lots of pots. 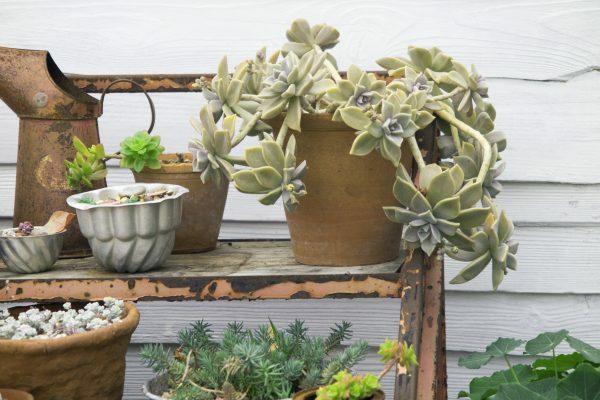 The Guinea is a very pretty garden with white walls and lots of pots. 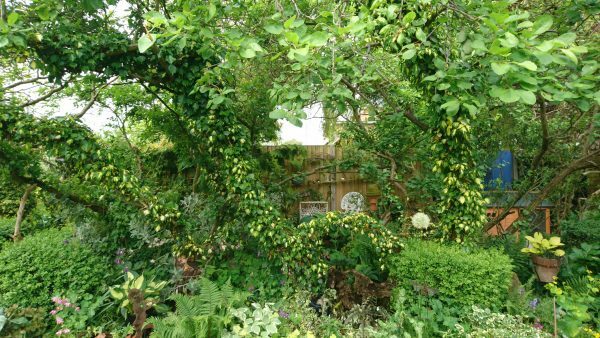 Teresa Brown in Joy Lane has deliberately grown ivy up some ancient fruit trees in order to have some greenery in the winter. It’s a variegated ivy so it doesn’t look too dark. 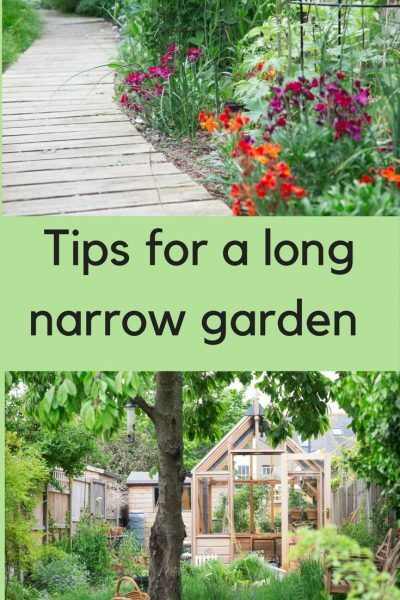 Don’t miss Argyle Road – a typical long thin town garden transformed by Mel and Emma, great for wildlife and plant lovers. 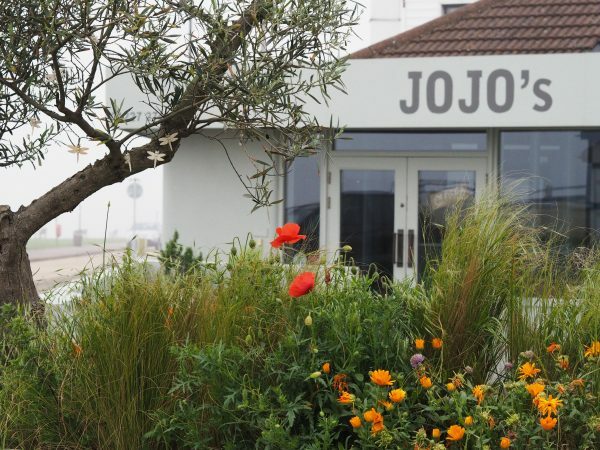 Somewhere for lunch – Jojo’s in Tankerton is a favourite of mine. 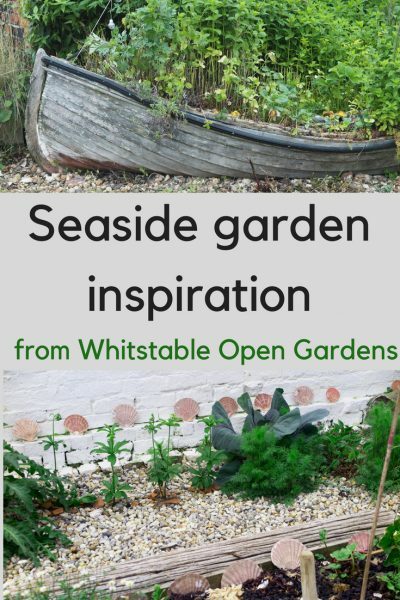 See here for tips and ideas on creating the beach garden look at home, and here for more seaside garden ideas from Whitstable. 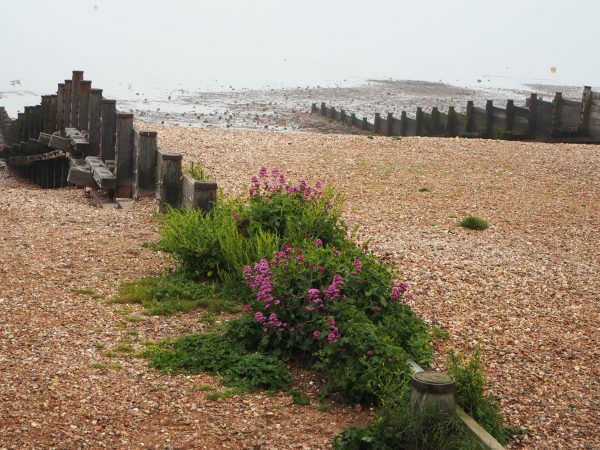 Whitstable Open Gardens is held in June. Tickets £6 available from the individual gardens, see the NGS website. 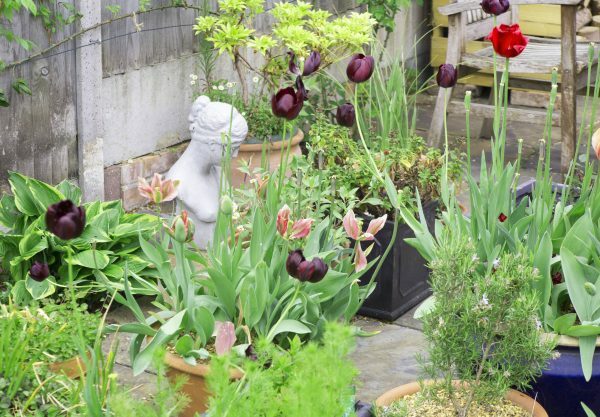 Faversham Open Gardens and Garden Market Day is on 24th June, 10am-5pm with 29 gardens and 25+ market stalls.